Basecamp 2 notifications help you stay on top of what's going on in your projects. By default, Basecamp 2 sends notifications to the email you use for your ID. You can send notifications to another address. Very helpful if you're a member of multiple accounts! 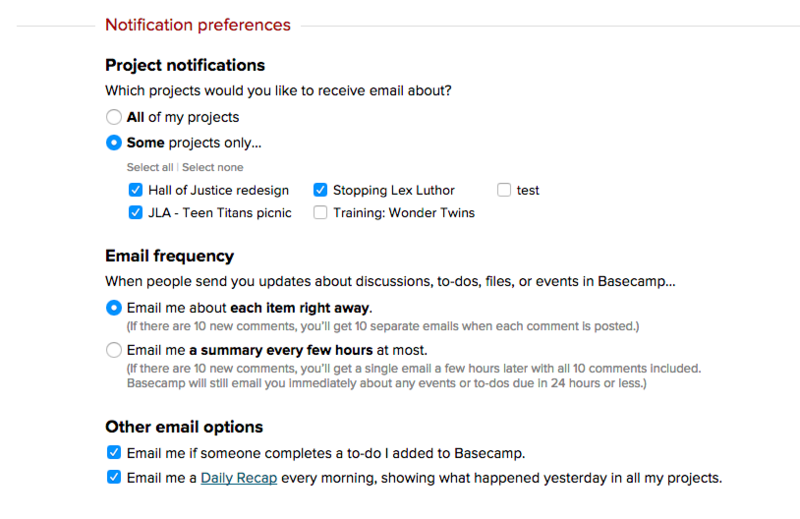 To update your notification email address, click "Me," then click "My Basecamp Settings." Add your new address. Basecamp will send all the notifications for this account to the new address. You might not want to be notified about every single project in your account. To avoid being bombarded by email overload, you can select which projects send you email throughout the day. You can also sign up for the Daily Recap, an email summary of all the activity in your projects. And there's an option to opt out of notifications when someone completes a task you assigned. Choose which projects can send you email notifications. You can also decide to receive notifications right away, or to have Basecamp send a summary every few hours. Even if you have a project de-selected, it will still appear in your Daily Recap so you stay caught up. If you stop receiving email notifications for a project, there are a few places you can check. Check your settings in your "Me" page and make sure you've marked that project to send you email. Check the message or comment and make sure your team has added you for notification. Check your spam folder. If Basecamp has been sending you a lot of email, it might have triggered a filter. Use our Email check to make sure you're getting email from Basecamp. If all else fails, send us a ticket and let us know which notification you didn't receive.